1 of 6 Heat oven to 350 degrees . Line 18 indents of 2 cupcake pans with paper or foil liners. 2 of 6 In small saucepan, combine 1 cup of the strawberries, 4 tablespoons of the gelatin and 2 tablespoons water. Heat over medium heat for 9 minutes or until bubbly. Transfer to a small bowl and let cool 30 minutes. 3 of 6 In a small bowl, whisk flour, baking powder and salt. In large bowl, beat butter until smooth. Beat in sugar until fluffy, about 2 minutes. Beat in eggs, one at a time. 4 of 6 On low speed, alternately beat flour mixture and buttermilk into butter mixture, beginning and ending with flour. Stir in cooled strawberry mixture. Divide batter among liners, about 1/3 cup in each. 5 of 6 Bake at 350 degrees for about 24 minutes or until tops spring back when lightly pressed. Cool cupcakes in pans for 5 minutes, then remove to a rack; let cool. 6 of 6 In small saucepan, combine remaining 1/2 cup strawberries and remaining 2 teaspoons gelatin. Cook 5 minutes over medium heat until gelatin is dissolved. Cool 20 minutes. 1 of 1 In bowl, blend confectioners' sugar, butter, milk and vanilla until smooth. 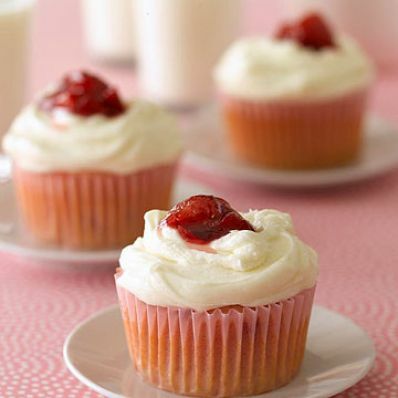 Once cupcakes have cooled, spread with frosting, about 1-1/2 tablespoons for each. Make a small indent in center of frosting with a spoon. Spoon scant 1/2 teaspoon cooled strawberry mixture into indent on top of each cupcake. Chill 15 minutes, or until set. Per Serving: 14 g Fat, total, 51 g carb., 4 g pro., 345 kcal cal., 141 mg sodium, 1 g fiber, 9 g sat. fat, 76 mg chol.